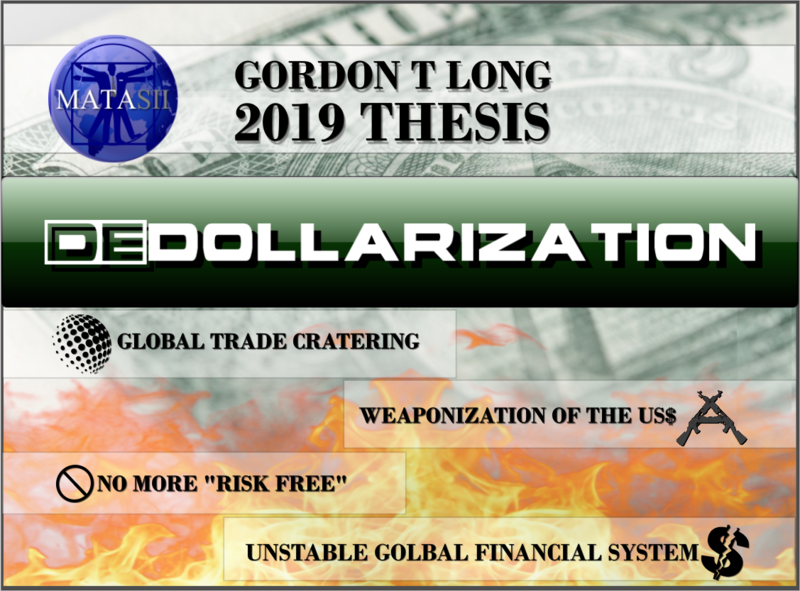 SOURCE: 02-13-19 - ""Things Are Deteriorating Quite Fast": Europe Emerges As World's "Weakest Link""
"It is Europe that increasingly looks like the biggest threat to global growth." Perhaps more so than the outcome of the US-China trade war. Industrial output for the Euro area slumped 0.9% in December from November, double the forecast, while the annual decline was the steepest since 2009. The Bloomberg euro index is near its lowest since mid-2017 and European stocks have never been cheaper relative to bonds in terms of yield gap. Germany’s prospects are crumbling after a protracted slump in manufacturing. Household spending has also ground to a halt in France - "Together those two countries account for about half the euro-area economy"
"If France stops consuming and Germany stops producing you have a major problem in the euro zone." The decision by Santander not to call a contingent convertible note only adds to the woes plaguing Europe's banks. 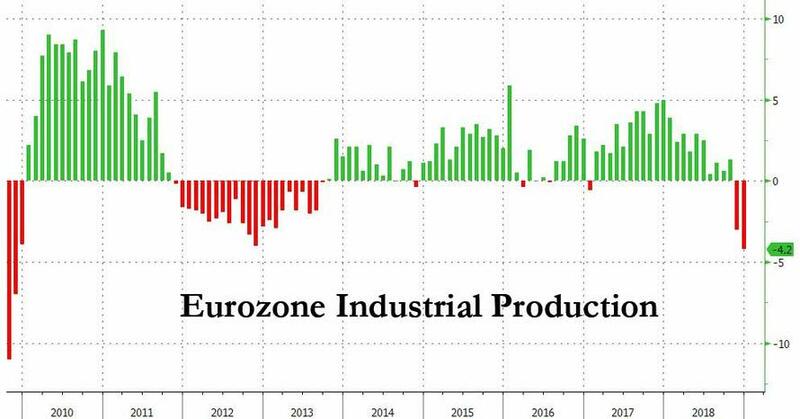 "Things Are Deteriorating Quite Fast": Europe Emerges As World's "Weakest Link"
Last week, when looking at the latest regional Industrial Production figures out of European nations, we made a simple observation: while GDP has yet to confirm, Europe is now in a recession. And according to Bloomberg, just a few days later, Europe has indeed emerged as the world's weakest link, and perhaps more so than the outcome of the US-China trade war, "it is Europe that increasingly looks like the biggest threat to global growth." As evidence, Bloomberg cites the same data that we highlighted last week, namely that industrial production across the 19-nation euro area is "falling at the fastest pace since the financial crisis, and deteriorating demand is evident as the region finds itself squeezed between international and domestic drags." According to Wednesday data, industrial output for the Euro area slumped 0.9% in December from November, double the forecast, while the annual decline was the steepest since 2009. That leaves Europe's GDP at risk of barely reaching 1% in 2019, a sharp slowdown from 2018, with even continental powerhouse Germany in trouble. That, of course, is a polite way of saying that Europe is on the verge of a recession, if not already in one - as we claimed previously - and as seen in the following chart showing the recent series of disappointments in European economic data relative to expectations. Making matters worse, Europe is sliding into contraction at the worst possible time: just as the ECB has ended its QE, although the silver lining is that any speculation for a rate hike by Mario Draghi have been permanently crushed, and like in the US, the only question now is when will QE return. As a result, the Bloomberg euro index is near its lowest since mid-2017 and European stocks have never been cheaper relative to bonds in terms of yield gap. And investors are not happy. While Europe is no stranger to sluggish growth, the extent and suddenness of the latest bout of weakness is different, as unlike previous episodes, it "reflects that the slowdown is hitting the core of the region." As Bloomberg notes, while the likes of Greece were at the root of past sluggishness, this time Germany’s prospects are crumbling after a protracted slump in manufacturing. Household spending has also ground to a halt in France, which is beset by the Yellow Vest protests. "Together those two countries account for about half the euro-area economy", and any coordinated contraction in the two assures a Eurozone recession, best summarized by the following quote from Ludovic Subran, deputy chief economist at Allianz. 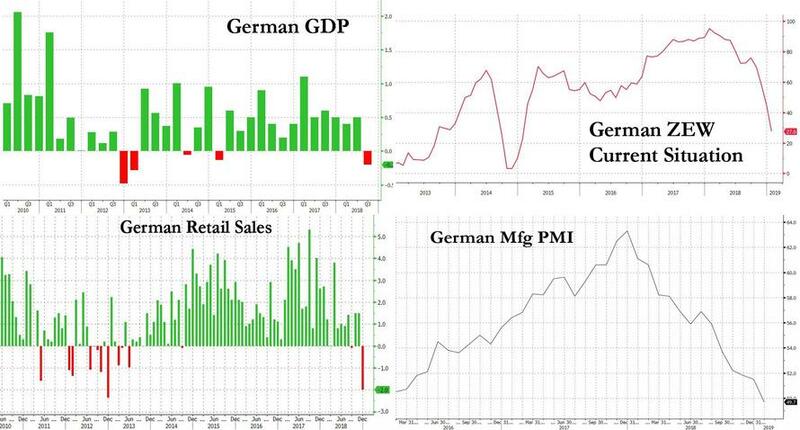 : "If France stops consuming and Germany stops producing you have a major problem in the euro zone." It's not just the economy, however, as Europe's demons that were previously stuffed under the rug, are once again starting to re-emerged: Italian bond yields, after a torrid burst of buying in the past few months, have once again started to creep higher amid doubts over fiscal management, the health of banks is questionable and Brexit remains unresolved. Yesterday's decision by Santander not to call a contingent convertible note only adds to the woes plaguing Europe's banks. Oh, and just one more observation: Deutsche Bank. Nuff said. And speaking of the devil, Deutsche Bank's chief economist David Folkerts-Landau said this month that “downside risks have risen sharply in Europe” (he did not discuss his employer's key role therein). As for the reasons behind Europe's collapsing economy, they have been widely discussed previously, and revolve mostly around China's economic slowdown, with automakers such as Fiat citing weaker demand in the world’s second-largest economy. That’s filtering through to other companies, "with Brussels-based Umicore saying last week that profit will be held back by the global automotive slowdown." All of this is known; what is not known is what Europe can or will do if its slowdown fails to reverse: "If it does get worse, there’s a question over how authorities could respond, and the European Central Bank has little left in the tank." Yet another unprecedented central bank intervention may still be needed. According to Bloomberg, Germany’s downside may be limited by "record-low unemployment along with modest fiscal stimulus. And Bloomberg Economics research suggests that spillovers from Germany to other euro nations is usually containable. That’s partly because it has a different structure and its shocks are country-specific." Unless, of course, this time is different, with it is because even with a slumping Euro, Germany's export powerhouse is unable to capitalize on this export subsidy. Meanwhile, like Deutsche Bank, Goldman recently downgraded its near-term euro-area expectations, although it remains optimistic on the longer-term outlook, and sees an improvement later this year, thanks to a boost from lower oil prices and fiscal policy. ABN Amro economist Aline Schuling shares the view: "The domestic economy is quite resilient. You could very well have a negative first quarter and a weakish second, but after that it should pick up again. 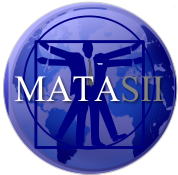 I don’t expect a deep or prolonged recession." 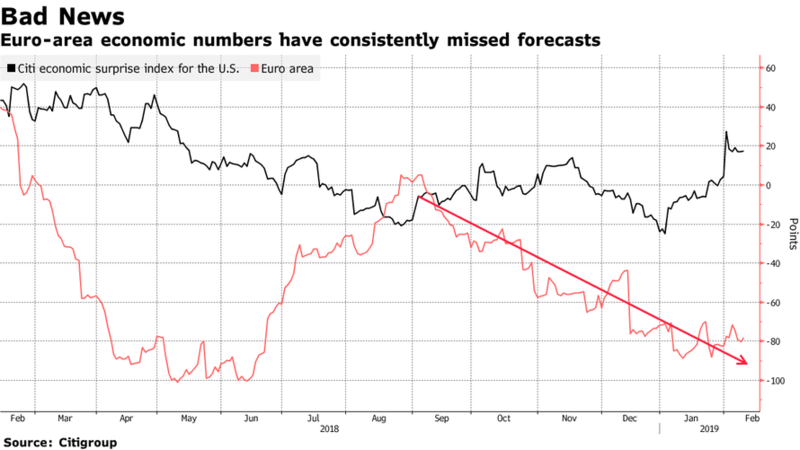 Which is bad news for traders, now that the world is back in a global race to the rates bottom, because the deeper and more prolonged the recession, the more assured yet another major intervention by the ECB.